During the middle of February, the club tennis team traveled to Madison, Wisconsin to compete in the Tennis on Campus Sectionals tournament. The team went 2-3, with all three losses coming to the talented teams of Notre Dame, Michigan, and Marquette. Despite this, the team yet again made the gold bracket, continuing our reputation of having a great team for such a small school. Despite the losing record, there were many bright spots during the tournament. For example, our mixed doubles team of first-years Evan Kubiak and Maggie Stopa pulled out a 6-4 win against a very talented Michigan team. First-year Hannah Nabhan won a marathon 6-5 singles match against Marquette. Junior Matthew Dickett and first-year Parker Anderson demolished the Marquette men’s doubles team 6-1. And sophomore Erich Endres came back from down 2-5, 0-40 to win against Hillsdale College. The final scores were d. Hillsdale College 30-15, d. Illinois State 30-7, l. Notre Dame 30-15, l. Michigan 28-8, l. Marquette 24-19. It was a great tournament with lots of good playing all around, and we are looking forward to the Spring Invitational in Orlando in late March! Go Dawgs! The club tennis team hopes everyone had a fun, relaxing Christmas break! While we were away, the courts were resurfaced in the Tennis Bubble and they look fantastic! For pictures make sure to check out the Men’s and Women’s tennis team’s social media accounts. The biggest difference between the new courts and the old ones is the amount of traction you can get when moving. The old courts in numerous spots were slick, and it was easy to lose your balance when sliding or changing direction. The new courts allow for a much faster change of motion, and you have much more control when sliding as well. A major benefit to the new courts is also the clear lines. Especially on the baseline, the lines are easy to see and they make close calls much easier to determine. But with these new courts comes the need to keep them in good condition. It is important to always wear tennis specific shoes when playing on new courts as to not damage them. Tennis specific shoes are clear by their wider bases and reinforced sides. For example, it is much more difficult to roll your ankle in tennis specific shoes, since the sides are much more sturdy. In order to avoid injury and damage to the courts, always make sure to wear proper tennis shoes when participating in any physical activity on a tennis court. That’s all for this update, the club tennis team is excited for tournaments to come in February and March! At Club Tennis tournaments, you not only need good players to win, but you need good teams, specifically in doubles, since those make up 3 out of the 5 matches. Tennis is also not all about pure ability and natural talent. There are many strategies and tactics you can implement to drastically improve your game. In this post, we will focus on doubles. Much more often than in singles, a doubles team that is worse ability-wise can often pull off upsets against better players. This is because ball placement, strategy, and teamwork are extremely important to succeed in doubles. The two most important shots in doubles are serves and returns. Yes, this means volleys aren’t the most important shots. A good server can set up their partner at the net for a put-away, and a good returner can neutralize the advantage the serving side has. Let’s talk about serving. Before the serve, either by coming together and talking or with hand signals, you and your partner should have a plan for where the serve it going, and what the net player is going to do. There are three choices for the location of serve: down the T, body, or out wide. The effectiveness of each serve depends on your opponent; if they are a right hander with a weak backhand, go down the T on the deuce side and out wide on the Ad side, changing it up occasionally. Serving in doubles is all about setting up your opponents in a bad situation. You don’t have to have a powerful serve, you just need to be smart with it. For the net player, it is all about whether or not to poach. Poaching is when the net player moves over into the middle of the court, cutting off a ball going cross court. This, of course, leaves the down the line shot open, but it can end the point immediately if done correctly. Poaching is especially effective with a good server because your opponents’ returns will most likely be weak down the middle, so you can win the point immediately. This synergy between the server and net player is extremely important in doubles. If you plan well before every point, you will stand a great chance at holding serve and put the pressure right back on your opponent. Remember, a smart team can always beat a skilled team. The Butler Club Tennis team participated in the Toledo Clay Court Invitational last weekend from October 19-21 and finished in 3rd place with a 5-1 record. There was great play all around and it was awesome to see the new faces on the team enjoying their first tournament. One interesting factor about this tournament was that it was played on clay, not hard court like we are used to in the tennis bubble. Many of our players had never played on clay before, so we sat down and talked about the differences between playing on the different surfaces. Clay lends itself to much longer, more tactical points; the ball bounces higher and slower, which means you can get more balls back to your opponent. Another key part of playing on clay is learning how to slide. You can be a good player without learning this skill, but sliding on clay courts allows for faster recovery (and it looks pretty cool). Finally, the other variable our players had to deal with was the wind. A cold front was coming through during the weekend, so the winds really began to pick up throughout the tournament (we even had to go inside at one point, it got so windy). The best way to combat blustery conditions is to put tons of spin on your shots. The more spin you use, the more the ball will cut through the wind. Also, depending on the wind direction, you should change your tactics. It the wind is at your back, use lots of topspin and move forward into the court; your opponent’s shots will get held up in the air, allowing you to be more aggressive and take control of the court. In the opposite situation, you can swing much harder on your shots. You don’t need to worry about hitting the ball long, the wind will bring it back in. So go for it! That’s all from this weekend. Go Dawgs! September was the first month of the club tennis season, and the new practice schedule is going very well. The competitive and non-competitive practices are doing a great job of giving everyone more playing time. However, there are also many things you can do while not practicing to help your tennis game. First, there are many exercises you can do to stay in shape and improve your strokes. One of the best is workouts with medicine balls. All you really need is a ball and a wall. First, start in a closed stance, like you’d be hitting a forehand or backhand, about three feet from a wall. Hold the medicine ball in your hand and load your weight on your back foot. Then, explode forward, throwing the ball at the wall, then catch and repeat. This will create a noticeable increase in power in your tennis strokes. Another great thing to do is actually to participate in different sports. 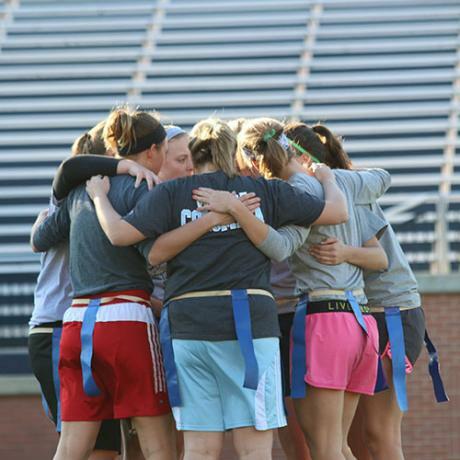 Butler offers many intramural opportunities, and each one has its own benefits. For example, the stance used for playing defense in basketball mimics the ready stance in tennis. By playing, you will improve your lateral movement and reactions. Another example is volleyball, which really helps your split step. Just like in tennis, whenever the opponent spikes the ball to your side of the court, you need to be light on your feet and ready to go wherever the ball is headed. Find an area with a tall ceiling and place a piece of tape on the floor. Pretend that this is the baseline. Grab a tennis ball, and mimic the motions of a serve, focusing on the toss. Dictate the rhythm of the toss, keep your muscles relaxed, toss the ball in the air and let the ball drop to the ground. Do this until you can toss the ball at your desired height and bounce at the desired place past the “baseline” 100 times in a row. Lifting weights is beneficial, but don’t forget to stretch it out! It is very important to have long lean muscles, and one of the best ways to do that is stretching after a strengthening exercise. Do some research. The pros know it the best, and there are plenty of sources online that show how and why they chose their personal methods of playing. Sometimes, in order to improve, you need to take it back to the basics and learn from the ones who know best. Although it is still encouraged to utilize these tips, with the help of Butler Club Sports, the Club Tennis team has found another place to practice starting November 6th! See you all on (and off) the courts! Good luck to the few players traveling to the Badger tournament this weekend! Go Dawgs! So far the Club Tennis team has had an amazing start! After appearing at Block Party and talking with many of the interested first year students, the Executive team and the returning players were very excited to see the enthusiasm and talent they would bring to the first practice. We were not disappointed. The turnout was better than expected, and the pumped up attitudes were contagious. Because we have two practices every week, we decided to dedicate our Monday practice to a specific stroke, including groundstrokes, serves and volleys. Our Wednesday practice is dedicated to fun – we always play games and create more of a social atmosphere to get to know the team better. This method has been working great to create relationships between players, while also improving skills each week. Stay tuned for more updates throughout the semester, and don’t forget to follow us on social media! 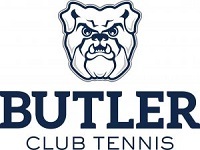 At the beginning of October, Butler Club Tennis hosted Play (317) Tennis On Campus: An Alumni Event. The event was held through the sponsorship of the USTA Tennis On Campus to provide opportunities to former club members. The format of the tournament was in played with World Team Tennis (WTT) rules and the same as all USTA club matches. The event at Butler was run with a fun, welcoming, and competitive environment! Each participant received a t-shirt, lunch, and the possibility of winning prizes. Music was played throughout the matches and the players were able to meet other local tennis players. All of the sets were great matchups and played hard. Tennis was not the only sport being played, as participants played corn hole between matches and could take a swing at our homerun derby competition using tennis racquets and balls. Play (317) Tennis On Campus: An Alumni Event provided local Indianapolis club tennis players the chance to meet and compete together. Dawgs finish the season with a W, beating Indiana St A 25-21! 6 months ago by clubtennisbu DaWgs win 3rd place at this weekend’s Toledo Clay Court Invitational!! Big thanks to @tolclubtennis for hosting! 1 year ago by clubtennisbu & #x2757 ;& #xfe0f ;player spotlight& #x2757 ;& #xfe0f ; Rachael Lewis serves as the president of Club Tennis this year, after being vice-president previously. She is from Danville, IL and is triple majoring in Marketing, International Business and Spanish. This is her fourth and last year on the team, and we will all miss her smiling face and awesome singles matches next year. Best of luck in your future Rach! Go Dawgs!